Pew Research Center’s survey shows that, generally speaking, these independent 501(c)(3) organizations stand out in a number of ways. They are less likely than other organization to launch with large seed grants; instead, they pull in money from more diverse revenue sources and, in doing so, raise more money overall. They also have bigger operating surpluses. The finding that independent outlets may be in better financial health than organizations attached to sponsors may help explain why some in the nonprofit sector are asking the IRS to open up its process for granting 501c3 status. Unlike most of the outlets sponsored by universities and other organizations, the majority of independent outlets did not receive large seed grants to help them get off the ground. Sixty-one percent of all the journalism nonprofits that responded to the Pew Research Center survey said they received start-up grants amounting to at least one-third of their original funding. But less than half (15 out of 32) of the independent outlets received that much seed money, a far cry from the four-fifths (22 out of 27) of university-sponsored organizations that did. Perhaps out of necessity, independent organizations have been particularly successful at diversifying their sources of revenue, which often is essential for long-term survival. About three-quarters (25 out of 32) reported that they have at least three revenue streams. That compares with less than half (10 out of 23) of those sponsored by non-news organizations and a third (nine out of 27) of those sponsored by universities. They also, on average, brought in more money overall. Nearly a third of the independent organizations (nine out of 31 that responded to the question) generated more than $500,000 in revenue in 2011, which was the case for only two university-sponsored outlets. In fact, about half of university-sponsored outlets (nine out of 17 that responded to the question) did not generate even $100,000 that year. With bigger budgets, many of the independent organizations have more paid employees than the smaller, sponsored outlets. Four of the five nonprofits with the largest number of paid, full-time employees-ranging from 15 to 70-are independent. Independent nonprofits are often more profitable than their sponsored counterparts. Seven of the 10 outlets in the survey that had the largest operating surpluses in 2011-ranging from 27% to 72%-were independent. Independent outlets tend to have smaller cash reserves than outlets sponsored or published by other organizations. As discussed earlier in this report LINK, cash reserves are a tricky element to assess. Within the nonprofit news realm, reserves of even three months may be sufficient, particularly among younger organizations and those with few employees. That said, the independents surveyed here do stand out for having fewer reserves than outlets sponsored by other organizations and universities. More than half (18 out of 32) of the independent outlets reported having less than six months’ cash on hand. That compares with about a third (four out of 11) of nonprofit outlets sponsored by other news organizations and far fewer (three out of 27) among those sponsored by universities. Indeed, more than half (15 out of 27) of university-sponsored outlets said they had enough money set aside to operate for a year or more without additional revenue. It is worth noting, however, that some of the organizations with only a few months’ worth of cash on hand also have been around as long as a few decades and are unlikely to disappear anytime soon. Do independent nonprofits have a different editorial focus than those sponsored by other organizations? Not particularly. Independent organizations, like others, cover many different subjects. The two areas in which they are particularly strong-general interest news and investigative reporting-reveal more about the breadth and depth of what they do than about a preference for specific issues. Among the 50 independent outlets, about a third (16) cover general interest news, 15 specialize in investigative reporting, four cover government and two cover the environment. Indeed, independent outlets specialize in investigative reporting, which is time-consuming and expensive, more than any other type of organization. Of the 45 outlets that report on general interest news, 16 are independents and 18 are sponsored by universities. Geographically speaking, the largest segment of organizations-65 outlets, or 38% of the 172 nonprofit news outlets-covers statewide issues, including government. 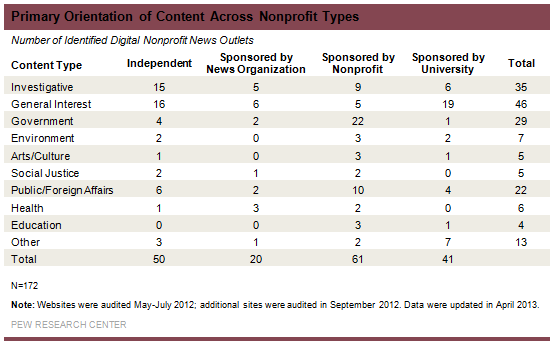 But state coverage is dominated by 40 outlets that are sponsored by other nonprofits. This category is significant because many legacy outlets have reduced or eliminated their coverage of state governments. Another 50 of the 172 outlets, or 29%, cover metro, or city and suburban, news. Sixteen percent cover national news; 8% cover hyper-local news, which often is at the neighborhood level; 6% cover international news; and 4% cover regional, or multi-state news. Among the 50 independent organizations, the picture is slightly different. The largest group of independent outlets-19 of them-covers metro news. Another 14 cover state news and seven cover national news.